response from property - Feb 02, 2017 Thank you so very much! We appreciate your comments. Love it here, maintenance is always quick and the staff is great submitted by Alexis M. - Feb 18, 2016 |Recommended: YesI love living in forest isle's. The community is awesome and you feel safe and right at home. when you need something fixed the maintenance is always on top of it. The staff is helpful when you have questions or are just picking up a package from the office. The neighbors are friendly i defiantly don't have any complaints. I LOVE IT!! !submitted by Tysheka W. - May 08, 2013 |Recommended: YesI LOVE LIVING IN FOREST ISLE APARTMENTS. MY FAMILY REALLY FEEL SAFE LVING BACK HERE.I LOVE THE SECURITY GUARDS AND THAT I HAVE TO BE CALLED TO APPROVE A VISTOR...YAY!!! THEY MOST DEFINITELY FIX WHAT NEED TO BE FIXED AND THEY DO IT ON TIME......II HAVE NEVER RENEWED A LEASE IN ANY APARTMENT IVE LIVED IN BUT I MOST DEFINITELY PLAN ON RENEWING MY LEASE AT THE END OF JUNE!!! 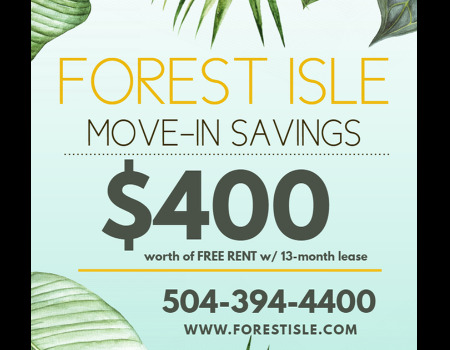 Forest Isle, a peaceful place to call home.submitted by Kendra P. - Jul 09, 2012 |Recommended: YesForest Isle is a quiet, clean, dog friendly environment that treats tenants like family! In addition, the 24 hour security is amazing! I really enjoyed my stay here at FI. I miss it and hope I am able to return if I reside in New Orleans again.submitted by EJ - Jul 01, 2012 |Recommended: YesI would tell them its like living in a quiet gated community or neighborhood. Its majority miitary, law enforcement and career based individuals. You are surrounded by mature individuals and you have a sence of security with the law enforcment and military residents along with the security that is provided. Maintenance is usually there at the right or desent time. VERY NICE for the price!submitted by Elizabeth - Mar 16, 2012 |Recommended: YesGlad I chose this community. Convenient location, really nice grounds and floorplan. My dog loves the dog park too. Love the gated entrysubmitted by Carlos - Aug 24, 2011 |Recommended: YesI love living in this quiet gated community. After a long day of work it feels so good to come home and relax in this peaceful environment. I love living here. Forest Isle management takes care of residetnssubmitted by Kim - Jul 27, 2011 |Recommended: YesI love living at Forest Isle Apartments because they take care of their residents. I just want to thank all the staff and contractors for their help, patience and kindness in dealing with last week's flood. And for re-locating me so quickly into my new apartment. Warmest thanks. submitted by Kimberlee B. - Jul 26, 2011 |Recommended: YesFor me the beautifully kept grounds, location plus friendly and prompt service mean a lot. The staff who work here are genuinely nice people who care and it shows! Perfect, Quiet, Safe & Friendly neighborhood to live submitted by E.A. - Jul 05, 2011 |Recommended: YesIt is a great place to live. The layouts are great and everything you need and want is here! Friendly workers and there is ALWAYS great security. Military Friendly! Thank you, love it!submitted by Gienna - Mar 30, 2011 |Recommended: Yes "Noticed you had a big crew out this morning cleaning up all the debris! Awesome that you care to clean up so fast, and a very big job for your guys! Thank you love it! : )"
"I love living in these beautiful apartments"submitted by Ashley G. - Mar 21, 2011 |Recommended: Yes"I love living in these beautiful apartments with all the cool anemities, they're pet friendly, have 3 different pools, spacious living areas, awesome neighbors, excellent security always on guard, and friendly office help. I will renew my 2 year contract, gladly!!! This is the perfect place for a growing family.... Btw, I do refer, LOL."